Doing laundry is a part of everyday life and it is helpful to add some built-in practical assistanceto make the process simpler. In an empty space above your dryer or elsewhere in your laundry room, add a shower rod. Hang specialty cloth items, like silk or linens for air drying or use it to keep ironed clothes wrinkle-free. The rod’s versatility makes it a handy tool to include in a laundry room. Clothes tend to explode everywhere in a laundry room. Utilize above the shelf storage for keeping items under control. Use separate baskets to store clothes, an iron, extra detergent and fabric softener, as well as sprays to clean stubborn stains. Knowing that these items are in one spot cuts down on your laundry time. Do you have empty space above your washer and dryer or on the opposite wall of your laundry room? Add a floating shelf to store items you need right away, like detergent, bleach and fabric sheets. If there is extra room on the shelf, use it to house towels, linens and extra blankets. The dryer is too harsh for certain piece of clothing and require air-drying so the material isn’t damaged. 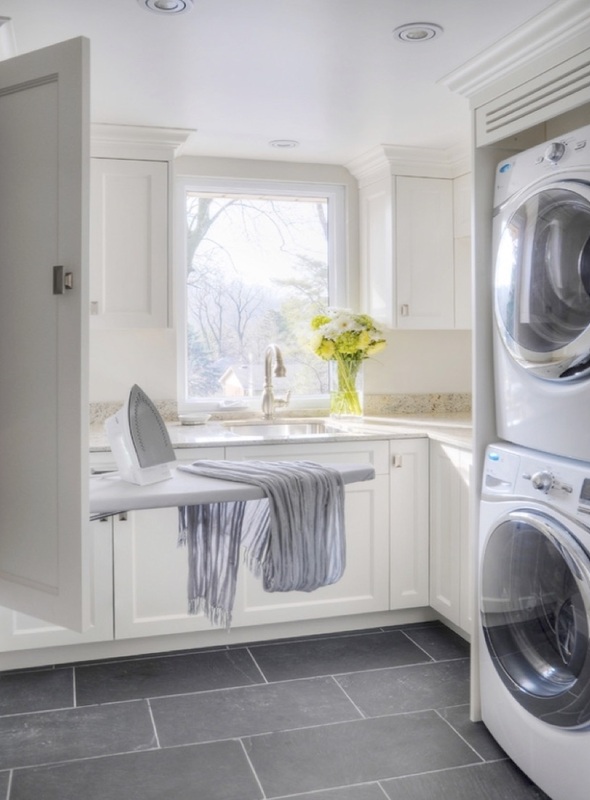 Survey your laundry room for a space where an built-in drying rack will fit comfortably. Dry smaller loads on this rack to save on electric bills. Are you leaving someone else in charge of laundry duty? Print out instructions and affix them to a corkboards in your cabinets. Stick reminders for your teens when they try to tackle laundry and also use it to jot down items you need to pick up at the grocery store, as well as pinning loose buttons that pop off in the dryer. In smaller laundry rooms, hooks are an effective tool for storage or sorting laundry. Label small bags and let them hang on these hooks. It will eliminate the time in hunting for a particular item and on sorting clothes. Hooks are especially helpful in smaller laundry rooms. Are you constantly trying to match a single sock with its pair? With multiple family members, chances are socks will disappear or get lost with other pieces of laundry. Add a few hooks, a string to a door and use mini-clothespins to hang socks and other miscellaneous items on this cute, but functional hack. It might not be your first choice to put a bookcase in the laundry room, but this type of storage will come in handy to sort out family member’s clothes. Use baskets for your needs and slide them in-between the shelves. The bookcase minimizes the chaos and streamlines the look of your laundry room. For more tips and tricks, head to Modernize.com. Jane Blanchard is a blogger, home design geek, and graphic designer from Savannah, GA. She currently writes for Modernize.com. I had every intention to write about something nice today – maybe something profound, even. But no. God gave me insight today through something not so pretty. Today I am writing about poop. Specifically, poop in pants. You see, the “going down for a nap process” began over an hour ago. We started the unbelievable “test of patience” known as potty-training nearly five months ago. So far, my twin girls have done fairly well with it – most of which I owe to the jar of Skittles that sits on the kitchen counter. However, there is one key component to the whole thing that they just don’t seem to want to take to: going “Number 2” in the potty. We’ve tried many things: double “yum yums” after a successful one, watching Mom do her duty on the potty, even putting their own poop in the potty after it lands in Nemo underpants and letting them flush it down themselves. But yet like clockwork, they both seem to wait until naptime, when they know they’ll be fully clad in their trusty old friend the diaper, to perform. So now, after the change of two extremely dirty diapers, two pairs of soiled pants, and one set of bed sheets, I sit here, eating my piece of dark chocolate, praying that my girlies will take the trip to dreamland which they both so desperately need. You may now be wondering: what does this have to do with faith? How could God speak to me through something as undesirable as human waste? As I stood at the sink, rinsing clothes which I knew I now inevitably had to wash (even though today was not supposed to involve any laundry), I thought to myself, “When are they going to get it? Why is this so difficult? I know they’re smart enough. And they go pee on the potty like champs! What else can I do?…” Sure, I’ve heard that getting the hang of this part of the potty-training definitely takes some time. But like the naive, relatively new parent I am, I had originally thought my kids would be over-achievers. Or, at the very least, that “some time” perhaps meant several weeks – not months. So then I wondered: How many times must God think the same thing about me? Does God ever get frustrated with me? Does He ever feel like I might just never “get it”? Time and time again, He’s had to clean up the messes I’ve made because I insist on doing the same things over and over – things that He’s not just asked me not to do or to do, but commanded me not to do or do! But you know what I did after rinsing out those soiled clothes? I crept back into my daughters’ bedroom to see them one last time before they drifted off to sleep. I kissed them both on the head and gave them a huge hug, telling them I loved them. Am I happy about having to change dirty diapers almost every day at naptime, the task which sometimes also involves an expected load (or two) of laundry? Most definitely not. But their behavior does not change my love for them and I’m not even close to giving up hope that one day they’ll get it. And this is exactly how God feels about us, too! To think that He loves me more than I love my children, blows my mind. For in His Word, He calls us His children (I John 3:1)! How amazing is that?! Just as I couldn’t help but snuggle each of my girlies once more, God also continues to love us in spite of our sins. And He will never stop. The house is quiet now, the clothing in the dryer. And I am exhausted – but still looking forward to hearing my girls wake up and feeling both of their warm arms around my neck. And I thank God that He feels the same way about me.